This project was completed back earlier this year. The house is situated on the top of a steep hill in a woodland area . This particular property had a long thin front garden which after negotiating the gradual slope up to the house, I found a decking area around the entrance to the house as well as at the entrance to the back garden from the conservatory. Both needed removing due to being very slippery surfaces and rotting in parts making it dangerous for visitors. The first job was to start by destroying the current decking at both the front and back of the property, this went really well with no splinters! Whilst doing this I found electric cables running across the areas I was working, these were identified and removed as required. 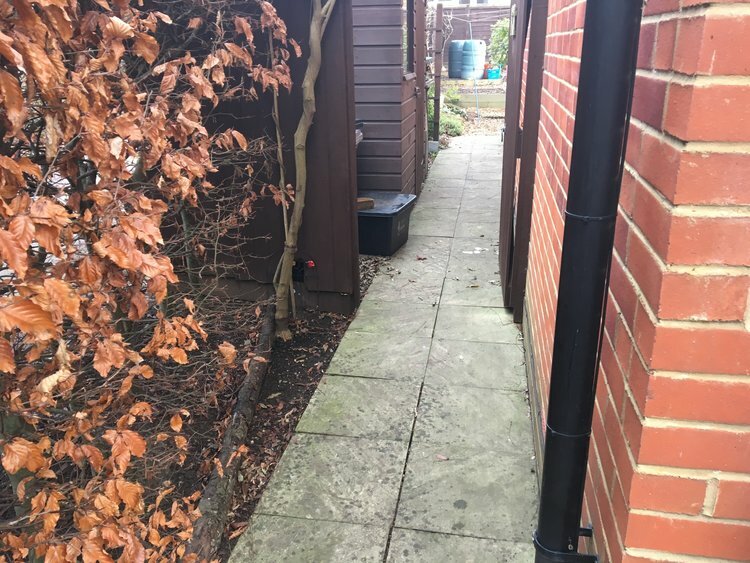 Once the deck was removed at the front of the property I was left with uneven ground which would need excavating to a depth of 100mm and a compacted scalping base installed. And once the deck was removed at the back of the house I found that there was a concrete hardstand all the way around to the front gate. I worked out my levels and as thought the concrete could be paved over. The metal drain cover that was situated on the corner of the conservatory was changed for a recessed cover which allows it to blend in with the other paving. The paving used on this project was Marshall's Heritage York, as you can see in the pictures this was laid in a repeating pattern .The paving was laid on a full bed of a sand and cement mix this is done to get the slabs to the correct levels that are required and to make them secure . The pointing mix was made using a white cement and sand so to get a mix which was more in keeping with the colour of the paving . Paving was used all around the house as it provided safe, easy to maintain areas for access and pleasure when needed.